If you want to understand flooring well, you should be able to properly identify the differences between underpads and underlayment. These things are not one and the same. They actually couldn't be further from that. Proper knowledge can often help you keep future flooring issues at bay. If you want to protect yourself from all different types of pesky flooring concerns, you should take the time to develop an understanding of all of the distinct and vital components that make up floors. Underpads, in short, are padding layers that are inserted directly below carpet. People often rely on them to stop skidding. They differ from underlayment in that they're designed to be used alongside carpeting. Underlayment, on the other hand, is designed to be used in conjunction with floors. The two things are totally different in this respect. They do have some key similarities, however. Underpads are similar to underlays in that they are placed right above subfloors. They function as layers in the middle of new carpeting and subfloors, too. Underpads are critical for a number of extremely valid and strong reasons. They can make the carpeting in your residence stay in strong condition for much longer. That's because they have the ability to minimize pressure and tension. Underpads can do a lot more than just that as well. They can offer reliable insulation. They can decrease sounds. They can even increase feelings of softness and smoothness. Underpads also bring some sanitation benefits to the table. They can minimize unpleasant smells and stains on carpeting. That's because they can stop spills and debris from accessing subfloors. Underpads, last but not least, can also encourage better health in your home. That's a significant bonus. Since they help keep spills and debris away, they can often halt the development of bacteria, mold and mildew. Bacteria, mold and mildew are examples of substances that can often be highly detrimental to human health. Mold can cause considerable respiratory concerns. It can make life harder on people who suffer from ailments including asthma and seasonal allergies, too. A carpet underpad can help you breathe with more comfort. A carpet underpad can also be good for the other individuals who share your residence. Underlays are placed in the middle of subfloors and floors. They're vital elements of brand new flooring. They're particularly crucial for laminate flooring. If you have laminate flooring, there's a strong chance that you're familiar with underlayment and how it operates. Underlayment is crucial because it makes adhesion and floor smoothness possible. If your underlayment is installed in the correct manner, it can do a lot for you. It can give your floor strengthened longevity. If you want to avoid costly floor replacement for as long as possible, underlayment can often help. Underlayment can also improve your lifestyle in a significant way. It can give your property additional insulation. It can make it a lot more comfortable in general as well. If you give your underlay some time, it can reward you in numerous key ways. It can keep a wide assortment of potential troubles at bay. Examples of these are floor cracks, splits, squeaking noises, open seams and seam woes in general. If you want to enjoy this degree of protection, underlayment can help you do so. A laminate underlay can do so much for your peace of mind. A laminate underlay can help you feel more at ease when you're walking around your property on a daily basis, too. That can be extremely convenient. Options in underpads and underlayment alike run the gamut. If you're looking for carpet pads, you can choose between foam rubber, sponge rubber, bonded urethane, felt pad and flat rubber pad offerings. There are other options beyond just those, too. If you're looking for underlayment, you can explore numerous different types of offerings as well. Underlayment comes in a handful of diverse materials. If you're interested in purchasing an underlay that's on the softer side, you can look at rubber, fiber, felt, cork and foam. If you're interested in buying an underlay that has a much tougher texture, you can look at recycled wood or plywood varieties that may be available to you. Underlayment that was constructed using fully recyclable material isn't at all hard to come across these days. If you want to make good underpad and underlayment purchase decisions, you have to first consider your specific kind of flooring. It doesn't matter if you have vinyl, engineered, hardwood or laminate flooring. You should also carefully consider your heating system, desired insulation, basic daily floor traffic and overall humidity. These factors can also help you greatly with the decision making process. They can often ensure that you don't choose an underpad or underlay you'll regret later on. 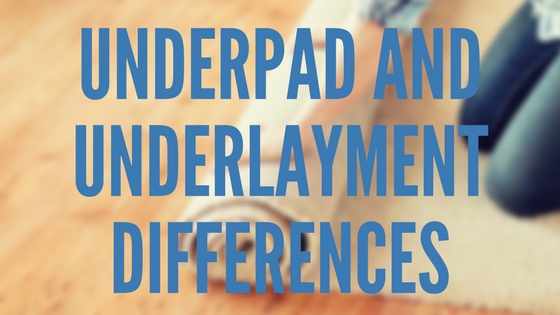 Underpads and underlays are indeed different concepts. They do share some common ground, however. They can make your carpeting and flooring considerably more comfortable and cozy. They can help contribute to the lifespans of your carpeting and flooring as well. That can be extremely advantageous for people who have carpet and flooring cost replacement concerns. Carpeting and flooring replacement can often cost people lots of money. The process can also require significant amounts of time. If you're looking for the best laminate flooring on the market, Global Alliance Home Improvement Products Inc. is ready to assist you. If you're searching for the best laminate flooring prices out there, we can assist you all the same. Contact our established Ontario business without delay to learn more about our plentiful, modern and exciting offerings. Contact us now to experience laminate flooring options that are the cream of the crop. Our laminate flooring choices are first-rate.